BAND of MAGICIANS had quite an amazing limited run in Las Vegas. JAMES GALEA, STUART MACCLEOD, JOEL WARD and BRETT LOUDERILK were quite the team. Funny and Engaging and by the end of the run a packed house. What will be next?! This is how the “Band of Magicians” hits the Strip. The foursome of James Galea, Joel Ward, Brett Loudermilk and Stuart MacLeod opens at Tropicana Theater on Oct. 26. Tickets, from $39 to $99, go on sale Monday morning (go to TropLV.com or call 800-829-9034). Breathlessly billed as “The World’s First Magic Supergroup,” the performers will work in the 7 p.m. slot Wednesdays through Mondays. The goal is to mesh the guys’ well-honed performances with their engaging personalities. “We hope people can identify with four normal dudes on a stage that are doing things that are remarkable,” Loudermilk says. “You’re watching that happen, while thinking, ‘I want to be friends with those guys.’..
Sold out in NEW ZEALAND! 2015 Arts Festival "Magical genius bringing joy to the audience"
Each member's fierce sense of one-upmanship drives the whole Band of Magicians to new, increasingly impossible feats, creating magic that draws on their collective talents, far surpassing what one magician can accomplish alone. Keep your wits about you for this one. It's awe-inspiring entertainment from the finest magic specialists around. From Australian Stage: As if they stepped out of a fashion catalogue, the quartet who compose Band of Magicians – created by Australia's #1 Magician James Galea –the group look, talk and act completely different than any other visual illusionists out there. 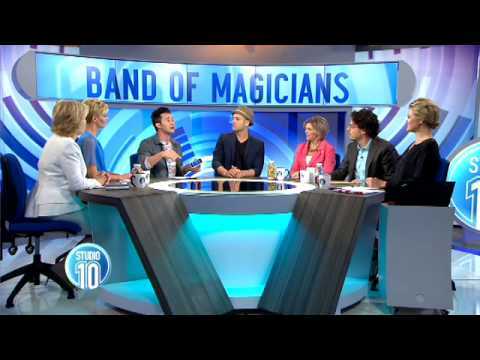 With the exception of the intro, the show was devoid of stereotypical laser, smoke and half naked magician’s assistants, it was obvious that Band of Magicians was going to take an alternate route to entertaining an eagerly awaiting Melbourne audience.